Graduation Day was always going to be one of the high points in the life of young Tyler Solomon. Still, the senior from Missouri’s Marshfield High School could never have foreseen how great that day it would actually be. 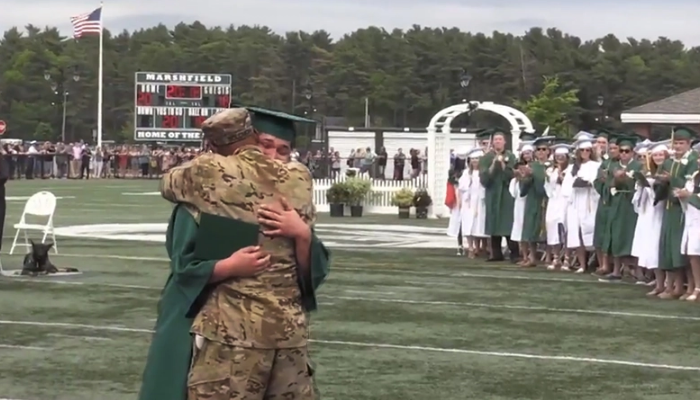 Tyler walked onstage like his 335 classmates, accepted his diploma from Principal Robert Keuther, and shook the principal’s hand, just as all the rest had. Tyler looked around, wondering why he was waiting—and saw a sight that raised the joy of graduating to an entirely new emotional level. There, crossing the school’s football field and approaching the stage, was a man in military fatigues—Tyler’s father, U.S. Army Sgt. Damon Solomon, who Tyler hadn’t seen since the start of the year. Sgt. Solomon climbed the stage, and the father and son embraced while the crowd applauded. “I said to him, ‘Do you honestly think that I was going to miss this?” Sgt. Solomon recounted later to ABC News. Sgt. Damon Solomon had been serving his fifth tour of duty in Eastern Europe. Since January, he had been a helicopter crew chief in Kosovo. The elder Solomon wasn’t due home for another six months, but he made some quiet arrangements—special circumstances called for special tactics. No one in the Solomon family knew Sgt. Solomon had taken leave and arranged a flight home. The entire family was as surprised as his son Tyler. Tyler got to share that day, marking his greatest life achievement, with the man who meant most to him in the world. And Sgt. Solomon probably felt exactly the same.